All-in-one computers are great space savers and offer consumers much bigger screens than laptops have. These all-in-ones can even take the place of some TVs for people since they can play movies, music and games too. There are many different models of all-in-ones available but trying to decide which one to purchase can be a real challenge. We’ll help make that choice much simpler for you. By doing plenty of research and talking to industry experts, we have brought you the top rated all-in-one computers for you to take a look at. We’ll give you the details of each of these computer systems, reviewing the features, specs and performance of each. These reviews are written to provide you with detailed information on three top rated all-in-ones that might be the perfect computer system for you. Our goal is to save you time, money and the headache of having to try and find the right information that will help you decide which all-in-one computer system will work the best for your computer needs and preferences. Use these reviews as they were intended to be used. Learn about the top rated all-in-one computer systems on the market today and then, read our buyer’s guide to learn even more about how to choose the perfect all-in-one computer for your needs. 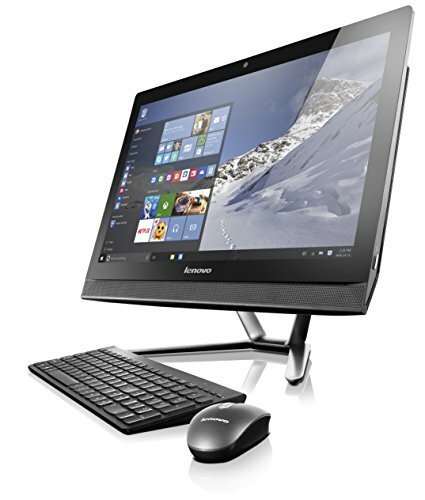 If you’re looking for a new computer but don’t want the same old style, you have got to check out the Lenovo C50 23” All-In-One Touchscreen Desktop Computer. It has an Intel Core i3-5005U, a 2.0 GHz Processor, 8 GB DDR3 Ram, a full 1 TB 7200 rpm Hard Drive, Windows 10 operating system, and Intel HD Graphics 4400. The large 23” touch screen is perfect for all of your computer needs, whether you get on the computer just to check email and play Facebook games, or if your business is computer based and you are on the computer every single day for 10-12 hours at a time. The sliding back cover on this all-in-one makes upgrading your memory and storage very simple and easy. Video chat with family and friends or use for business with the HD webcam that provides crystal clear communication with anyone you choose to video chat with. The integrated HD graphics, built in DVD reader and writer, stereo speakers with Dolby Advanced Audio, HDMI-in/out gives users plenty of impressive visuals and audio for a terrific and satisfying home entertainment experience time after time. The slim line design looks fantastic in any office or home and makes it very easy to unpack and set up. You can be online in very short order with this all-in-one. The touchscreen has been optimized for Windows 10, which is the OS that is installed. Another customer favorite is the simplified navigation, universal access to all of your favorite apps and Cortana, your own personal assistant. All in all, this all-in-one is a fantastic investment that will please in every way. This sharp looking all-in-one is the perfect addition to your family of electronics. The HP Pavilion 23” All-in-One Touchscreen has plenty of features that will make it perfect for all of your computer needs. With the latest Intel CoreTM i5-6400T Processor, speeding around the internet won’t be a problem at all. The integrated 10 point touch enabled widescreen offers 23” of entertainment and function at your fingertips. The backlit display offers 1920 x 1080 pixels, 8 GB of Ram, 1 TB hard drive, NVIDIA graphics and much more. Windows 10 comes installed with it. In addition, users will get a wireless mouse and keyboard for optimum convenience without the hassle of cords. There are plenty of USB ports on this model; 2 x 2.0 and 2 x 3.0, so there is plenty of room for adding additional multi-media should you want to. It is Bluetooth 4.0 integrated, the screen is adjustable to fit your preferences, and the DVD drive is re-writable. There are so many features and bells and whistles on the HP Pavilion All-in-One that you will have plenty to do to keep yourself entertained, whether it’s watching a movie or surfing the internet. Enjoy plenty of video chats with the 720p HP TrueVision HD Webcam that has integrated microphones. Many people use video chat for business as well as leisure like visiting with long distance friends and family. With a great webcam like this one, video chatting will be very simple and enjoyable. No matter what you need a computer for chances are you will find everything you need in this HP Pavilion 23” all-in-one computer. 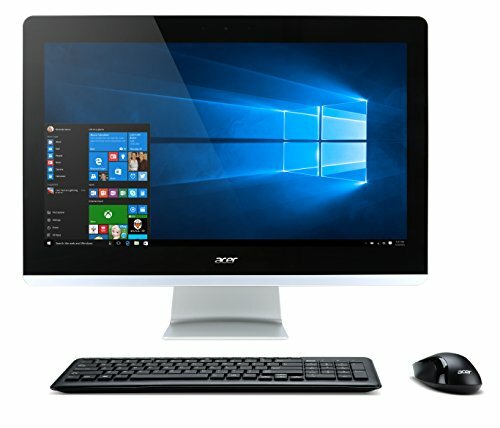 Acer does it again by providing function and entertainment with the Acer Aspire All-in-One Computer. 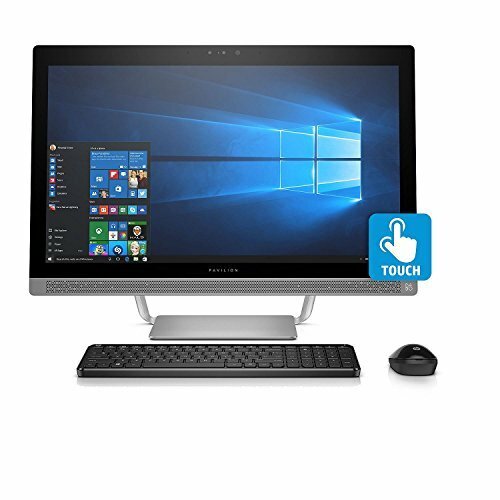 Equipped with a 5th generation Intel Core i5-7400T Processor, Windows 10 operating system, 12 GB DDR4 memory, 1 TB SATA Hard Drive, Digital Media Card Reader, HD Webcam, Gigabit Ethernet, Wireless LAN, Bluetooth 4.0 and tons more, you will be amazed at everything this excellent all-in-one offers. Listen to music or enjoy the soundtrack for your favorite movies with the High-Definition Audio and built in speakers. The all-in-one comes with extra USB ports for your additional devices; 1 x 2.0 and 4 x 3.0 ports. The wireless keyboard and mouse completes the package so you have everything you need to get up and running in minutes. The beautiful 23.80” widescreen has beautiful resolution to showcase movies, TV shows, photos and more in the best possible way. Many people use their all-in-ones as their primary entertainment center since what they offer IS so terrific. Whether you are looking for a business computer or a leisure one, this HP Pavilion 23.80” computer is a great choice to make, with plenty of features that make it exactly what you need. This system comes with a 1 year parts and labor limited warranty and toll free tech support. There was a time when Acer was not a very well known name, but not anymore. Now Acer is known for their exceptional electronics and this Pavilion all-in-one is proof of that. Any one of these top rated all-in-one computers is sure to impress and please consumers. Each one has plenty of features that make it an excellent, top of the line choice. Sorting through features and benefits to try and figure out which all-in-one is the best can be confusing for those who may not be up on computer terminology. Our reviews include three different systems from three different brands. All three are exceptional machines that will provide all the computer access and freedom that you could want. We invite you to continue reading below where we have gone into even more detail on what makes an all-in-one computer an excellent choice. With the right information you will be able to go through the choices that are available and decide which one is the best choice for what you want a computer for. All-in-One computers are gaining in popularity due to their large screen capacities and space saving capabilities. All-in-ones came out in the late 90s, manufactured by Apple. They are made of a single unit that has a built in monitor and hard drive in one. Gone are the days of having to have a large separate hard drive tower. After Apple introduced them to the world, other manufacturers jumped in, adding touchscreens, integrated TV tuners and many more features that have increased the popularity even more. They are truly all-in-one entertainment centers. The sleek designs that all-in-ones usually have are very appealing and look great in any room in the house due to the fact that they are much neater looking than the traditional desk top PCs. If you have decided that an all-in-one is for you, there are several things that you can look at to determine which one is the right one for you. All all-in-one computers are similar in the fact that they have the hard drive, speakers and monitor in one unit, but there are some features and extras that some models have that sets them apart. We’ll go over those differences in this buyer’s guide. One of the first things buyers need to do before they start shopping for an all-in-one is establish their needs. Are they gamers? Do they use the PC for business or just pleasure? What type of system requirements do their most often used programs require? All of these things will determine which model and what specs a buyer needs. After you have determined what your needs are, set a budget that you want to stay under. A budget is always a good idea because it will keep you from overspending and cause you to pay more attention to the features the systems have that you are considering. Things like faster processors, more RAM and larger hard drives means that the computer’s system will perform better. There are many different components that make up any computer and all-in-ones are no different. While they may have different or additional components they still need to compare different things to figure out which system will fulfill the needs and wants you have. Processor – The processor of a computer determines how fast programs run. The faster the computer’s processor is the more expensive the computer usually is. Processors are usually made by either AMD or Intel. Intel processors are the more expensive of the two and are usually faster than AMD processors. The high performance processor choice is Intel Pentium with Celeron coming in second at a lower cost and slightly lower performance. AMD is also reasonable, price wise and provides decent performance as well. Most of today’s computers have multiple processors which improve performance even more. This will show up as dual core or quad core, quad core being the fastest. Memory – RAM or Random Access Memory keeps your information in a temporary spot which prevents the hard drive from using up your memory when any programs request information. All programs require a certain amount of memory or RAM to run. It is important to know the system requirements of the programs you run most often so you choose an all-in-one computer that has sufficient RAM to run these programs. More RAM, of course, is always better, so try to get an all-in-one with as much RAM as you can afford. This will result in better performance as well. Hard Drive – The job of the hard drive is to store files and programs, including the all-in-one’s operating system. The more storage capacity your computer has, the more files and programs you can save. Hard drive size is measures in gigabytes or terabytes. 1 terabyte is equal to 1024 gigabytes. If your hard drive does not have a lot of space, you can purchase an external hard drive that you plug into your computer’s USB port. If you save a lot of movies, music and high resolution images you will want to ensure that you have plenty of hard drive space. Optical Drive – All-in-ones can come with either a CD drive or a DVD drive that allows you to read and write data to back up files and folders or to create DVDs or music CDs. The high end all-in-ones may have Blu-ray drives for watching HD videos. Sometimes a PC might have a combination drive that will allow the user to write or read in more than one format. Screen – One of the biggest selling points of an all-in-one is the capacity it has to have large beautiful screens. Larger screens are going to be more expensive, but having a large screen is a favorite feature of many users. Since many people watch movies on their computers, having a screen that is 21-27” or higher can make for excellent movie watching. Many of the all-in-ones are touchscreen capable, although if this feature is not wanted it can be turned off. Connections – To properly connect to the internet or a home network, the all-in-one needs to have a Network Interface Card. It is rare to find a computer without one these days. High end models include wireless network adapters with different components for both high end and budget conscious. Input and Output – Most users have many gadgets that they use with their computers. Devices like cameras, MP3 players, smartphones and much more can all be connected to the all-in-one through USB ports. Most all-in-ones will have both USB 2.0 and USB 3.0 ports available. The more ports the computer has the more devices you can use. Audio and Graphics – Users want to have good sound and Graphics in their computer systems to listen to music and play games. Get the best audio and graphics you can afford. Operating System – Your all-in-one will have an operating system pre-installed and depending on the brand of all-in-one, it will either be Windows or Mac OS. Mac OS can only be installed on Mac computers. Make sure that the operating system that is installed is compatible with the programs and features you use and/or want to use. Extra Features – There are many extras that all-in-ones can come with. These extras include webcams, wireless keyboards and mice, speakers and even TV tuners. Warranties and Tech Support – warranties and tech support are very important to offer the consumer peace of mind as well as help if they need it. Sometimes users have trouble setting up a new PC. If the company offers tech support, they can get help with this undertaking if it proves to be too difficult to do on their own. Warranties usually cover parts and labor for a specified period of time. There are many benefits to purchasing an all-in-one computer system. They definitely look fancy and save a lot of space, but are there other reasons too? Below we have listed several of the common reasons people want to purchase all-in-one computers. No need for a separate Monitor Purchase – One of the reasons people love all-in-ones so much is because everything is included in one unit with the exception of the keyboard and mouse. The screens are thinner and larger and the components of an all-in-one are together so setting up one is very much plug n play. You have everything you need to get online and get started. Excellent space savers – Because these units are all-in-one, they are much more space efficient than traditional computer systems. There are not a bunch of wires or cords to worry about and you don’t have to worry about where to put a hard drive and separate monitor. Less power consumption and heat generation – The components inside of an all-in-one generate less heat than traditional desktop PCs. In addition, the savings of space and the fact that the technology is similar to a laptop makes it more energy efficient as well. Easy to Use – All-in-ones are much easier to use than traditional PCs. Plug it in, turn it on and that’s pretty much it. They are also designed to be user friendly, so getting it online is just as easy. All-in-one computers have gained in popularity over the years once people realized how easy they are to use, how much they provide that laptops and traditional desktops don’t offer, and how terrific they look. The three top rated all-in-ones that we have featured in the review above are all excellent examples of the kind of features and attractive offerings that all-in-ones almost always have. We live in a computer era and people spend a large portion of their day interacting on the internet in some way. Having a good quality all-in-one allows for users to be a part of the internet savvy world in a stylish and fun way. The cost of all-in-one computers have come down significantly from when they first came onto the scene and getting a really good one can cost easily cost under $900. There are very few negatives when it comes to getting an all-in-one computer. With the space they save, the features they offer, the entertainment value they provide, they are an excellent choice to make when you are in the market for a new computer.